Nicole, an experienced and friendly instructor and a licensed Clinical Psychologist, has been teaching in local yoga studios across the country for 7 years. She incorporates the teachings of Astanga, Vinyasa and Anusara yoga. She has designed her courses to awaken your true Inner-Self. 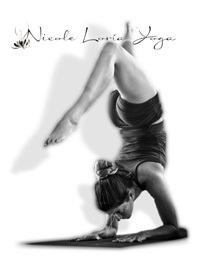 Nicole attended Astanga Teacher Training Course, directed by Larry Schultz, in her early twenties. As Yoga became her passion, she continued a vigorous Astanga practice under her teacher Mariela Cruz, owner of Namasté Yoga Studio in Costa Rica. After completing this courses, she started teaching yoga locally. But her thirst for knowledge about Yoga was increasing so later she completed the Nosara Institute 200 hr Interdisciplinary Teacher’s Training Course, where she received the internationally recognized Yoga Alliance teaching certificate. Hot Vinyasa classes are done in a heated studio that can reach 80 to 85 degrees. Vinyasa yoga offers benefits to the body and mind. Hot Vinyasa Yoga is one of the most comprehensive exercises one can do to fully awaken their body’s potential and energize the spirit. Vinyasa yoga is a series of poses that will move you through the power of inhaling and exhaling. Vinyasa movements are smoothly flowing and almost dance-like, which explains why it is sometimes referred to as Vinyasa Flow or just Flow. The postures are not held in a fixed position for long and they usually flow with rhythm to achieve synchronization. There are the obvious physical benefits of practicing yoga and meditation as a surfer, namely the improved balance, flexibility and concentration, plus the addition of core and physical strength. Yoga is more than an exercise as surfing is more than a sport. Both are ways of living that help make people attain a fuller and more complete life.